Dr Jengo's World: The Assassin's Creed IV Wave is coming! The Assassin's Creed IV Wave is coming! It's that time of the year again! The latest Assassin's Creed Installment is upon us. With Assassin's Creed IV Black Flag releasing today, in a few days or in your hands already, Assassin's Creed fans around the world are pretty excited for this. I love the series.. I wasn't one of those who jumped on the band-wagon after how popular the AC series became. Back in E3 2006, I watched the very first trailer and was hooked. Before AC, I was a fan of the Prince of Persia series. So when I learnt that Ubisoft had a new baby, I wanted to check it out. Based on what I saw.. I was excited already. 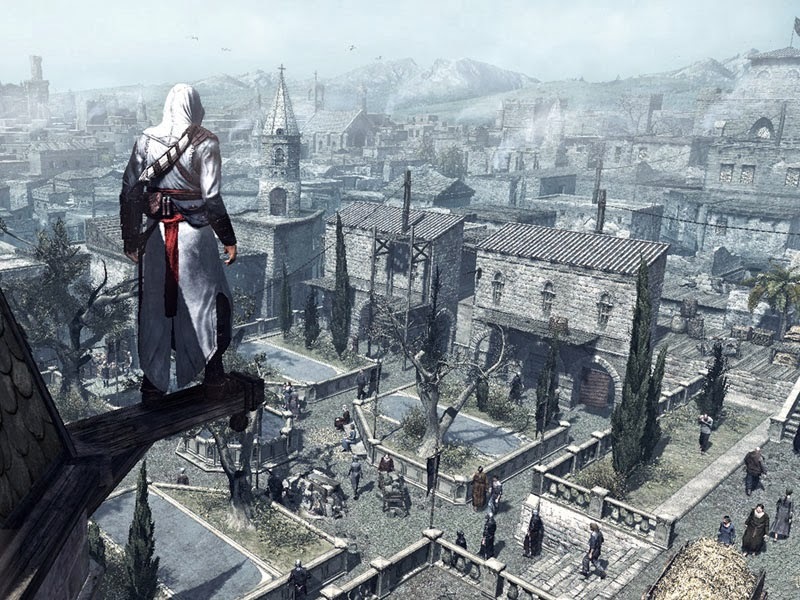 Fast-forward to 2013, 7 years later, I'm a huge fan of the Assassin's Creed series. The game that started it all..
Friends & regular readers would have already seen my AC figure collection over here. But that's not all.. I have CE Guidebooks, novels, comics, a stunning Tomahawk replica, numerous stuff from the various CEs and plenty more items associated with the Assassin's Creed world. In fact, that shelf can't even house all the figures that I have. So of course, I'll be getting a lot more stuff for AC IV! I'll have plenty of pics to share over the next few weeks. Some stuff are already on their way to me and many others will ship anytime this week. Let me tease you with what you can expect in the coming weeks.. The statues from the UK Black Chest Edition and the US Limited Edition had varying bases so I had to get them both.. then there's the 3rd statue from the UbiCollectibles range.. Then there's a replica of something, hopefully it will turn out nice! 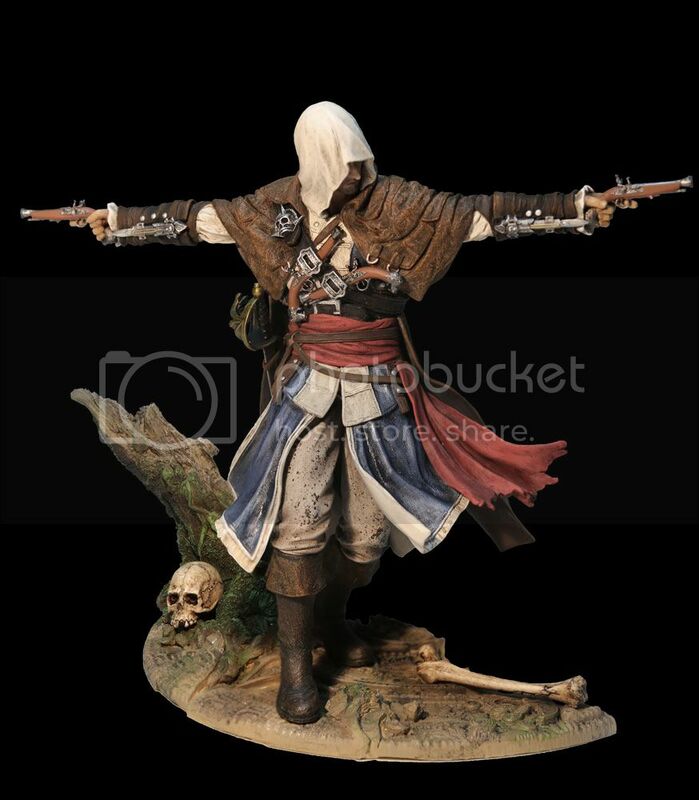 The 3rd Edward Kenway Statue soon to be here! I also lost out on to the battle against art stuff. Up till now, I have tried not to buy any art pieces or artbooks but I have always admired Ubisoft's art so after a long argument with myself in my head, I did what no rational collector would do... I went ahead and bought The Art of Assassin's Creed IV (the Limited Edition one in fact) and depending on how much I like it, will look for the AC3 one as well. Will have plenty of pre-order items from around Europe as well. 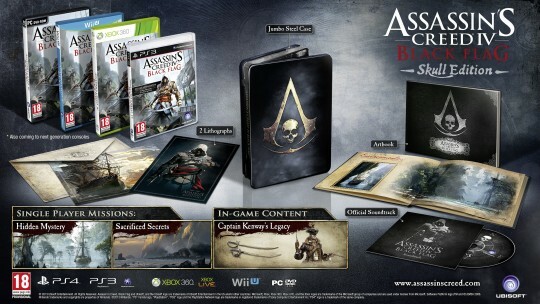 Just like last year, this year's Assassin's Creed game will be exciting in the collectible front for me. So many different items coming from many countries and it will be nice sharing the pics on the blog as well. So do keep popping back in to see all the updates in my collection.. Wait! That's not all.. There's a special deal for you guys! As mentioned, I'll have a couple of different Collector's Editions coming in. As much as I love the CEs, I don't need so many copies of the game. Obviously, one will be enough. So I'll be selling away all the extra copies. They should be coming in anytime in the next 2 weeks. So unfortunately, this deal won't be for those who want to play it on release. However, if you don't mind waiting a week or two, I will sell you my copy for a good price. How much? For the standard game, it will include some DLCs and since you have to wait a while, I can give it to you at $5-10 below retail price. Probably around early 2nd-hand market price. There will be different regions so if you don't really care about that, it should be a good deal for you considering you are getting a good discount for a sealed game. All PS3s can also play any region discs. I'll have one R1 copy so R1 collectors, you might be interested. I will also have the Skull Edition which isn't available in Singapore for anyone who is interested. Has a couple of standard collector's items for anyone who is interested in this. I can sell you the whole edition sealed if you like. I will give more details once they arrive or you can mail me at jveron004@gmail.com for queries or to let me know your interest. You don't need to make any deposits, we will do a meetup to deal. I would love to sell away all my extras asap so I probably won't be taking reservations and will be giving priority to those who can deal first or at convenient locations. I don't mind mailing it to you or shipping overseas either, but will need you to cover all postage costs. So yes, I will need you guys to help me out here. Spent quite a bit to get all the stuff that I want but would like to reduce my expenses by selling off the things that I don't need, especially the extra copies of games. So, if you are still considering on whether to get the game early, maybe you can consider this offer. If you have any friends that might be interested in this, do give them a heads-up as well. Those who know me or bought the extra AC3 copies from me last year, should know that I always do my best to give a good offer so hope this helps. Thanks again for reading and would really appreciate this help. If you decide not to, for whatever reason, not to worry at all. Hope you guys enjoy my AC Collection pics that will I'll be posting as they come! Watch Dogs to be delayed!